How can Paper.li help you develop an attractive online presence? The answer is found in what marketers call “inbound marketing”. Inbound marketing is the concept of creating and sharing content on social media or via a curated newsletter as a way to attract a community of promoters and customers to you. This visual, created by Hubspot, makes it easier to understand. Rather than using traditional, more expensive advertising to promote your small business, Paper.li can be used as a tool to attract leads, convert leads into customers, collect customer emails and delight them with your found content. Let me walk you through the 4 inbound marketing steps and show you how Paper.li can help with each of them. Paper.li is a powerful tool to help you automatically discover topic-based, relevant content to share on your Facebook page, Twitter, G+ and/or Linkedin profiles. By sharing content your customers would be interested in, you’ll begin to gather a following. It’s possible you start seeing some engagement from people liking, retweeting or even commenting on the articles, photos or videos you share. This gives you the opportunity to respond and interact in order to connect and begin a relationship with possible clients (with the goal of eventually creating a database of email contacts). Use the Paper.li Genius Source to find the best content on the web in order to appeal to your ideal customer. 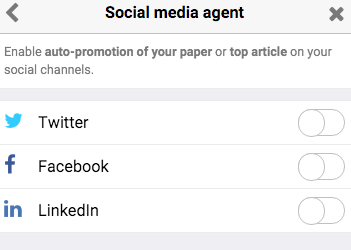 With our Paper.li Pro subscription, you can make use of the trusty Social Media Agent to automatically share either your entire paper or your top headline article to your social media accounts. Use your content shared on social media to drive traffic to your blog, paper, or website. Once you’ve attracted possible customers with content shared on social media, use Paper.li Pro to provide a call to action. It’s as easy as including a banner on your paper with an enticing message or adding customized ads leading to an offer on your website. Want to get inspired? See the banner our friends at Axiom Medical Consulting included in their paper to prompt readers to click and visit their website. Another way to drive traffic to your blog or website is by embedding the content into your primary website as a news widget so that when people click on your tweets or posts, they are linked directly to your site, instead of the paper . 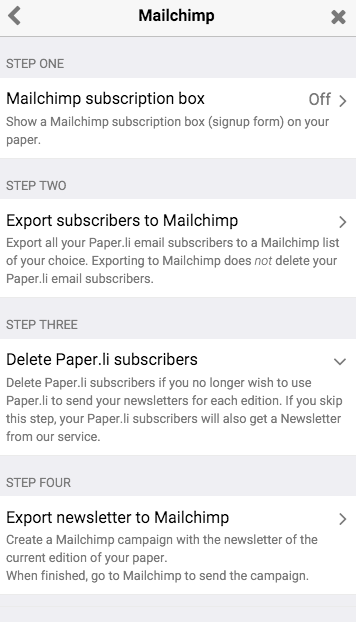 Paper.li Pro Tip: One key step we highly recommend you try out during this process is adding our subscription widget to your blog and/or website or directly to your paper – our Pro users can either show a Mailchimp or Paper.li subscription box on their paper or website. By doing so, you will be able to collect email addresses from your prospects and start building an email database. Email is still one of the best ways to reach your customers and we know that first hand at Paper.li. For more ideas on how to collect email addresses for your lists, go to this article by Inc.com. Okay, you have attracted some visitors and they have even accessed your website and looked at your product and offering. How can you convince them to actually purchase your product or service? You can start to send them emails with special offers and/or useful information. We recommend you use the Paper.li Newsletter to send them a nice, customized newsletter that includes helpful information about the service you provide. Make it personal and it will go a long way. Here’s an article on Newsletters & Email Marketing that can help you with that or you can watch the video below to get started. Don’t forget about your customers! Make sure you continue using the Inbound Marketing process and the tips we talked about to make your customers happy. A good way to do that is by continuing to use the Paper.li newsletter to keep your customers informed about the latest news on their topic of interest and to build trust to establish yourself as a subject expert. You can either send the newsletter directly from your paper settings or your Mailchimp account (as seen below). Do you have any questions?! Don’t hesitate to leave them below! Thank you Magda, the useful links help us improve our use of the Paper.Li service.